Tuxedni, Trident Seafoods Salmon Tender: she’s got a new tricked out wheelhouse for summer salmon tender season in Alaska. 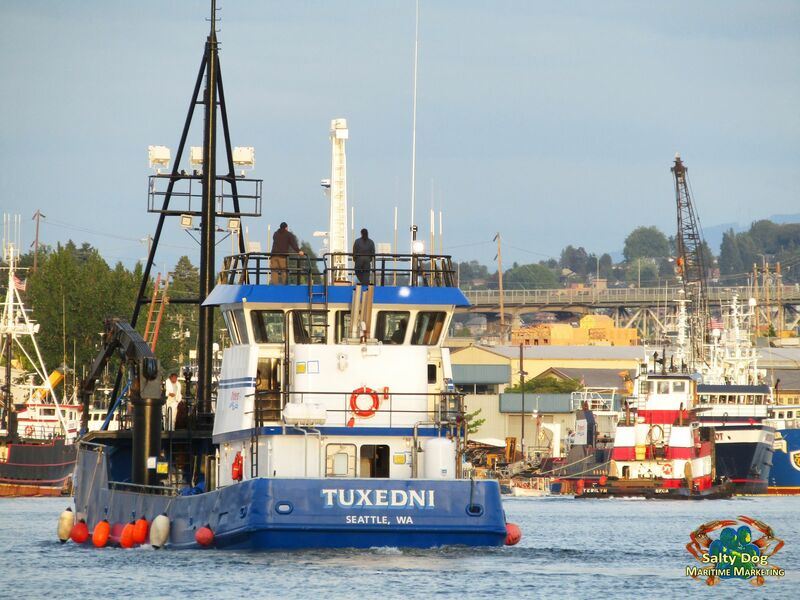 Tuxedni, spent a good grip of the winter and spring at Trident Seafoods Old Yard just went of the Ballard Bridge in the WA Ship Canal. 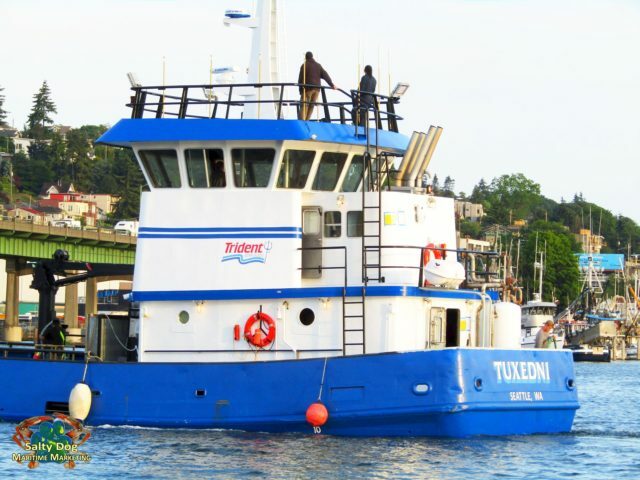 After a long season of custom designing the new wheel house she is not back and forth on sea trials in and out of the Ballard Locks for drops and lifts to jog around and check systems in the Puget Sound. Trident Seafoods is a fisheries giant and legend in the Pacific Northwest and Alaska seas. 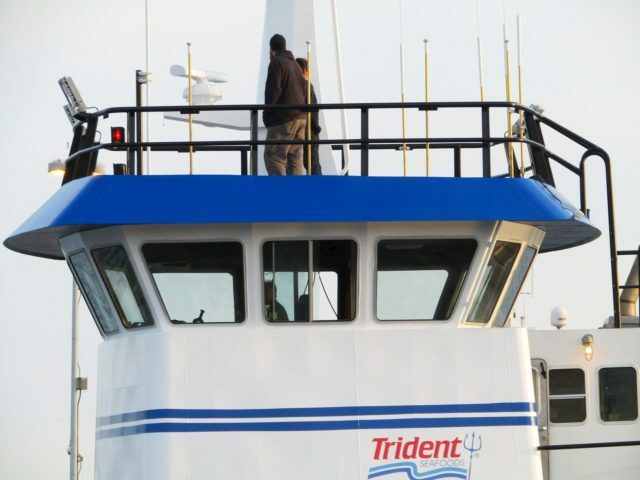 Trident Seafoods owns more than a dozen salmon tenders operating throughout Alaska, mainly in Bristol Bay and Southeast Alaska. Tridents shore-plants are located a good grip of distance from the fishing grounds, Tridents Tenders serve as remote buying stations, taking fresh salmon deliveries from fleets of small, independent fishing vessels and holding them in refrigerated seawater as they transport them back to the processing plants. 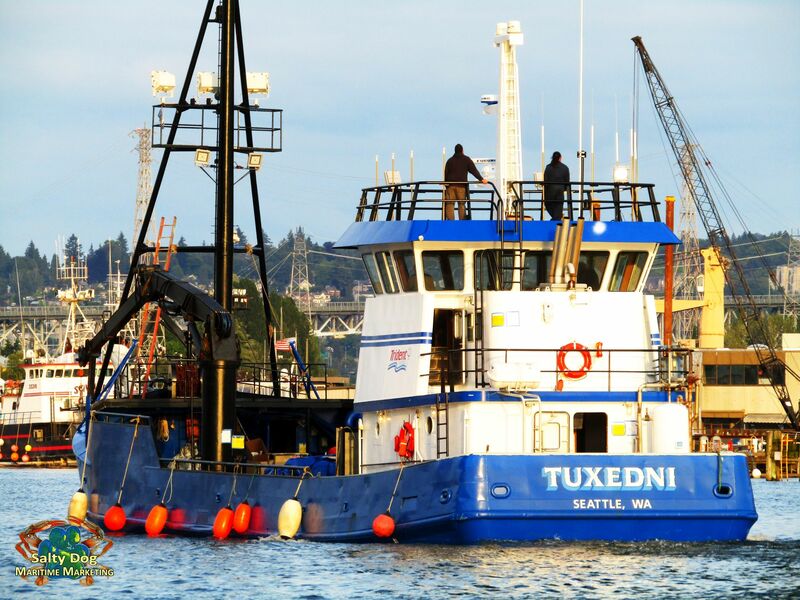 Tuxedni, Trident Seafoods, Salmon Tender, to Old Yard, New Tricked Out Wheelhouse, Looking Good, Photography by: Salty Dog Boating News, Salty Dog Maritime Marketing, Superyacht Pacific Northwest to Alaska Marine Traffic Source – Go Fishing!!! Trident Tenders are well oiled machines at sea they’re constantly operating in conjunction with additional private tenders chartered by Trident, the delivery fleet provides and uninterrupted flow of fresh wild fish to the plants and allows our fishermen to do more of what they do best, per usual it’s ‘catch the fish.’ Trident Tenders are basically a floating store they also supply groceries, fuel and spare parts to keep the small-boat fleet up and running. 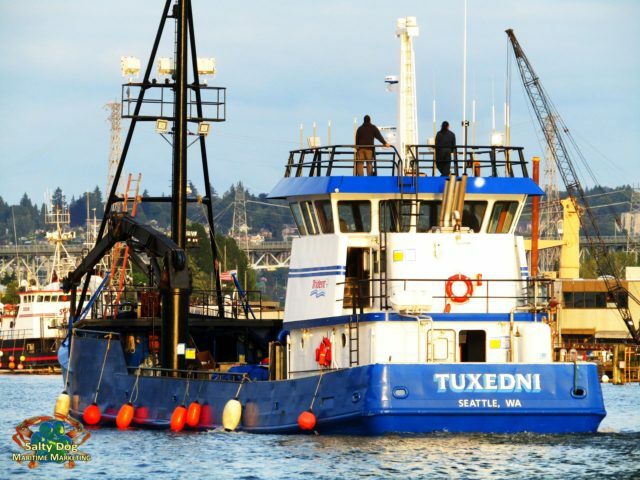 Tuxedni, Trident Seafoods, Trident owns more than a dozen dedicated salmon tenders operating throughout Alaska, Photography by: Salty Dog Boating News, Salty Dog Maritime Marketing, Superyacht Pacific Northwest to Alaska Marine Traffic Source – Go Catch-in! Tuxedni // Length: 119 ft. 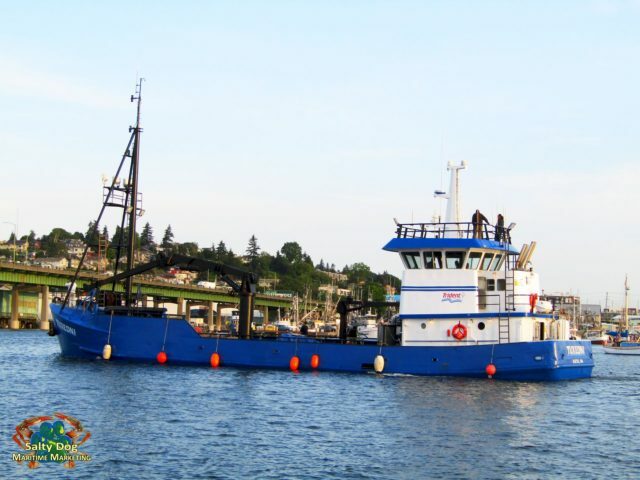 Wide Bay // Length: 73 ft.
Cape Calm // Length: 90 ft.
Cape St. John // Length: 77 ft.
Dolphin // Length: 175 ft. Entrance Point // Length: 107 ft.
Four Daughters // Length: 100 ft.
Hallo Bay // Length: 65 ft.
Last Frontier // Length: 118 ft. Perseverance // Length: 95 ft.
Balaena // Length: 105 ft.
Brittany // Length: 110 ft.
Bulldog // Length: 141 ft.
Trident Seafoods Tender Fleet, Tuxedni, Trident Seafoods, Trident owns more than a dozen dedicated salmon tenders operating throughout Alaska, Photography by: Salty Dog Boating News, Salty Dog Maritime Marketing, PNW TO AK Source!!! God Bless our Fishermen/Fisherwomen & their families at sea and on land!